"It's really weird," says Antonio Olmos. "Photography has never been so popular, but it's getting destroyed. There have never been so many photographs taken, but photography is dying." I'd asked the 50-year-old, award-winning, London-based Mexican photographer what he thinks is going to happen to the medium after a week in which it has come more unflatteringly into focus than ever before. 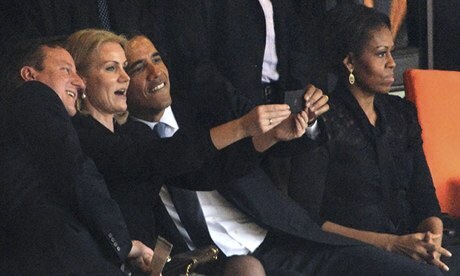 This was the week in which the most reproduced photograph was a photograph of someone (Helle Thorning-Schmidt) taking a photograph (a selfie of the Danish prime minister with two men becoming known as Helle's Angels, David Cameron and Barack Obama) at Nelson Mandela's memorial service. It was an image that seemed to typify the narcissistic nature of smartphone photography. But here's the twist. That photograph of a trio of politicians was captured by Agence France Presse photographer Roberto Schmidt using a digital SLR camera and a huge 600mm lens, and press photographers hardly ever use iPhones. But should they? Today the chief victims of the cameraphone are makers of point-and-shoot cameras. Only two years ago Annie Leibovitz helped put the nails in the coffin of such middle-market cameras by saying that the iPhone was the "snapshot camera of today". But tomorrow? Maybe cameraphone functionality will become so superb that all you losers who spent four- and five-figure sums on digital SLRs will be overcome with buyers' remorse and press snappers will be shooting with the same cameras as the rest of us. This was also the week in which psychologists argued there is a "photo-taking impairment effect". That means if we take a photo of something we're less likely to remember it than if we'd looked at it with our eyes. "When people rely on technology to remember for them," argued psychologist Linda Henkel of Fairfield University in Connecticut, "counting on the camera to record the event and thus not needing to attend to it fully themselves – it can have a negative impact on how well they remember their experiences." We're used to the complaint that we're taking pictures rather than living in the moment, and that makes us experientially poorer. But Henkel's study seems to go further, suggesting we don't even remember the stuff we take pictures of, making the snap-happy nature of modern photography doubly mindless. "People taking photographs of their food in a restaurant instead of eating it," says Olmos. 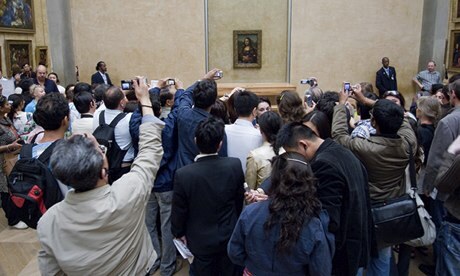 "People taking photographs of the Mona Lisa instead of looking at it. I think the iPhone is taking people away from their experiences." But what does Olmos mean by saying photography is dying? He argues that in the 1850s the rise of photography made many painters, who had previously made nice livings from painting family portraits, redundant. Now it's the turn of professional photographers to join the scrap heap. "Photographers are getting destroyed by the rise of iPhones. The photographers who used to make £1,000 for a weekend taking wedding pictures are the ones facing the squeeze. 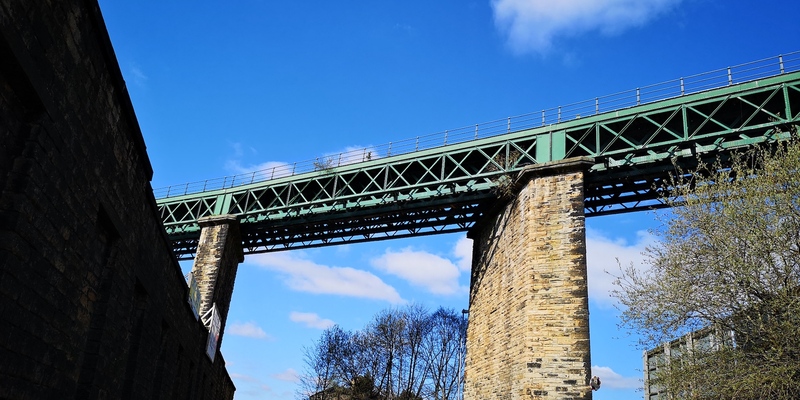 Increasingly we don't need photographers – we can do just as well ourselves." But doesn't that mean that some photographers are becoming obsolete, rather than that photography itself is dying? 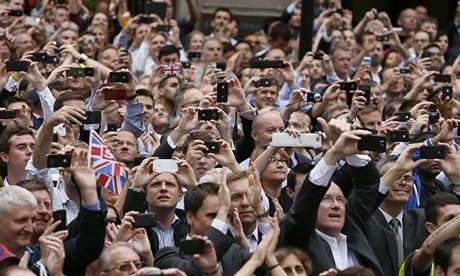 Isn't what we're witnessing a revolution in photography, thanks to digital technology, that makes it more democratic? "In one sense yes. I used to be sent on assignment to Iraq, Afghanistan and to photograph the Intifada – partly because there weren't any local photographers. 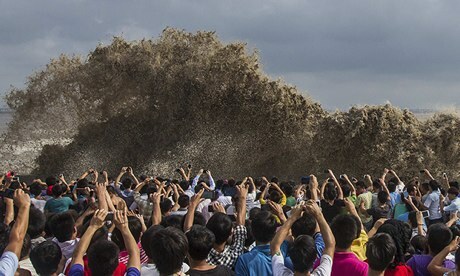 Now thanks to digital technology, there are locals taking images at least as good as I can. "Don't get me wrong. I love iPhones and Instagram," says Olmos. "But what I worry about is that Kodak used to employ 40,000 people in good jobs. What have they been replaced by? Twelve people at Instagram." Progress often has casualties, I suggest. "I don't oppose progress in photography," he replies. "I'm pleased there aren't darkrooms and suspicious toxic chemicals you guiltily throw down the sink. I'm pleased there are no longer photography companies who got silver out of Congo by bribing Mobuto for their film, as used to happen." But there's a stronger reason that makes Olmos argue photography is dying. "The iPhone has a crap lens. You can take a beautiful picture on the iPhone and blow it up for a print and it looks terrible." But who needs prints in a paper-free world? "For me the print is the ultimate expression of photography," he retorts. "When I do street photography courses, I get people to print pictures – often for the first time. The idea is to slow them down, to make them make – not just take – photographs." Guardian photographer Eamonn McCabe agrees: "At the risk of sounding like one of those bores defending vinyl over CDs, I think there's a depth to a print you don't get with digital." He recently looked up an old print of a picture he took of novelist and Nobel Laureate Doris Lessing, who died last month. "It was a black and white print I took with a Hasselblad, a tripod and a lot of window. It took me back to the days when photography didn't make people like me lazy." Why is digital lazy? "It's a scattergun approach. You snap away thinking, 'One of these shots will work', rather than concentrate on capturing the image." McCabe used to take two rolls of 24 exposures on a typical assignment. "Now I can shoot 1,000 pictures in one of these sessions on digital – and I give myself a massive editing problem as a result. I don't think photography's dead, it's just become lazy. People are taking lots of pictures but nobody's looking at them." For a more positive sense of what digital and cameraphone technology has done to photography, I speak to Nick Knight, the British fashion photographer who's just done two big assignments entirely on iPhone – a book of 60 images celebrating the work of the late fashion editor Isabella Blow, and a campaign for designer clothes brand Diesel. "I work frequently on the iPhone. It's almost become my camera of choice." Indeed, Knight reckons the democratising revolution catalysed by improved mobile phone cameras is as radical as what happened in the 1960s when fashion photographer David Bailey binned his tripod and started using a handheld camera. "It gave him freedom and changed artistically what photography was. The same is true for me with the iPhone. For years I would shoot on an 8x10 camera, which wasn't intended to be moved. Now I have freedom." But what about the "crap" iPhone lens? "Who cares? The image isn't sharp? Big deal! One of my favorite photographers is Robert Capa, whose pictures are a bit blurry sometimes – I love them because he's captured a moment. "What I'm into is visual connection to what I'm taking, not pin-sharp clarity. It's absurd for people to think all photos need to be high-resolution – what matters, artistically, is not how many pixels it has, but if the image works. People fetishise the technology in photography more than any other medium. You don't get anybody but paintbrush nerds fixating on what brush the Chapman brothers use. The machinery you create your art on is irrelevant." Not quite. The iPhone has revolutionised Knight's photography and he knows it. "I can wrap an image around a sphere, I can take out the black or white values of a picture. I couldn't tell you how it works, but it thrills me." But isn't that a loss? As McCabe says: "We don't engage with the camera any more. We don't know how it works." "I don't care about all that," says Knight. What he's engaged by is how photography has become truly democratic. "When I was a kid there was just one camera per family, if that. Now everybody has one and uses it all the time. That's great." But why? Knight has been researching images of punk bands lately. "There are hardly any images, and all of them are from on stage. Compare that with now – at a Kanye West gig you see a sea of cameras, and there's a database of images. I think that's fantastic – the new medium is much more democratic." But doesn't incessant picture-taking, as psychologists argue, make us forget? "That's old rubbish," says Knight. "Like that old nonsense about how sitting too close to the TV will infuse you with x-rays. My dad went around a lot of the time shooting with a video camera when I was a kid. Now we have lots of great old home videos as a result. So what if someone stands in front of a Matisse and takes a picture to look at on the bus home? I think that's great if they want to." But it's hard for professional photographers not to feel threatened. "Staff photographers are an increasingly scarce commodity, thanks to aggressive cost-cutting by newspapers and magazines, and amateur photographers are exploiting technological advances to produce stunning images, often using no more than their mobile phones," saysMagda Rakita, a 37-year-old student at London's University of the Arts and a professional photographer. "But technological advances work to our advantage, too. They allow professional photographers to share our work quickly and widely, and tell stories in engaging, innovative ways. Think, for example, of multimedia productions, iPad applications or eBooks, as well as the ability to make work accessible through Facebook, Twitter or Instagram. The latter mediums can be hugely significant tools for photographers and storytellers working with marginalised groups who, until recently, would not have had the opportunity of participating in the wider discussion and challenging mainstream views." But what about earning a living? She says: "Creating your audience is essential in a new financial model that increasingly relies on crowdfunding." In any case, established photographers don't necessarily have to worry about the democratisation of their medium. "I'll survive in this profession because I have skills," says Olmos. "I'm a storyteller in images; my compositions are better than most people's. Just because you've got a microprocessor in your computer doesn't make you a writer. And just because you've got an Instagram app on your phone you aren't a great photographer." Jimmy and Dena Katz photograph the World of Wonders traveling sideshow in their book (PHOTOS).